The NV207 1x Gen 2 Night Vision Monocular from Newcon Optik is second generation night vision device designed for close-range applications. 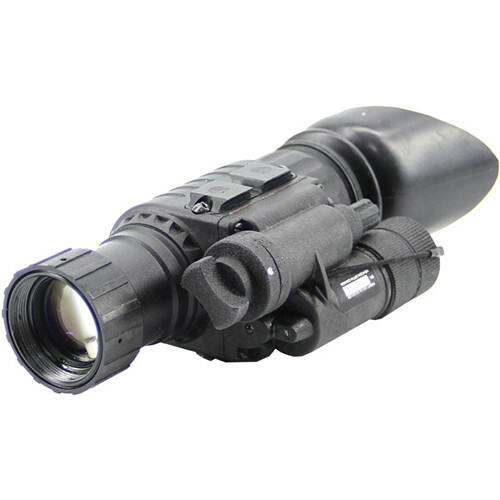 This monocular has an unmagnified 1x lens that transmits an angular field of view of 40°. At its core is a Gen 2 intensifier tube capable of up to 51lp/mm resolution and 18:1 signal-to-noise ratio, delivering adequate detail for almost any recreational activity. If the next hunt or low-light activity requires a magnified field of view, then the NV207 objective lens can accommodate Newcon's 3x afocal lens attachment. The monocular is also compatible with a range of accessories that enable helmet, weapon, and camera mounting. The included headgear set enables hands-free operation, and it also takes advantage of the monocular's auto-off function by deactivating the device when placed in the flip-up position. In addition to the f/1.17 lens system and 43lp/mm tube resolution, this monocular also meets Mil-Std 810 specifications for weatherproof performance. Even in heavy rain, subzero temperatures, or extreme humidity, the NV207 is built to consistently deliver. An integrated infrared illuminator, flexible rubber eyecup, and 10" close focus distance make the NV207 a full-featured NV monocular for a wide range of low-light glassing tasks.